AT MIDNIGHT on 10 October 2010 the Netherlands Antilles officially ceased to exist. At the governor’s office in Willemstad, Curaçao, the Antilles flag – that has flown since 1954 – was lowered and removed. In its place officials raised the new blue-and-yellow flag of Curaçao, emblazoned in the upper left quadrant with two white stars. The Curaçao Prime Minister, Gerrit Schotte, congratulated the island’s population on their new status. But Curaçao did not become independent. Recent polls in the Netherlands Antilles rejected full independence in favour of a structural reorganization of the Kingdom of the Netherlands, expanding upon a trend established by Aruba. 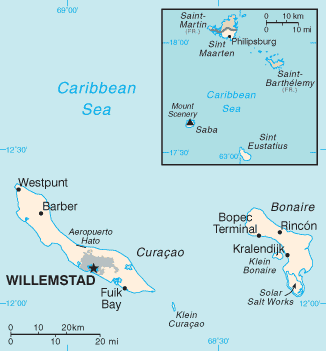 In 1986, the popular tourist island elected to leave the Netherlands Antilles, gaining greater control over its economy and social services. In so doing, Aruba became the second country of the Dutch Kingdom, an arrangement similar in many respects to devolution in the United Kingdom. On Sunday, Curaçao and St Maarten became the third and fourth countries of the Kingdom of the Netherlands, respectively. Bonaire, St Eustatius and Saba were reclassified as ‘autonomous special municipalities’, similar in status to domestic Dutch municipalities. Through this new relationship, Bonaire, St Eustatius and Saba will be more closely managed by Amsterdam, but will also receive greater representation in the Dutch Government. Is the dissolution of the Netherlands Antilles indicative of a broader trend in contemporary colonial administration? France offers an interesting comparison. In 1946, Martinique and Guadeloupe voted against independence, instead choosing to become ‘overseas departments’ of the French Republic. In this capacity, they were effectively incorporated as an integral part of the French state. This method, although useful from an imperial perspective, was not without its faults; Algeria balked at the notion that they were an constituent nation of the French Republic and initiated a violent war of independence. Although small independence movements do currently exist in New Caledonia and French Polynesia, all of the remaining French territorial possessions have chosen to become overseas departments. As constituent countries of the French Republic, they – like any domestic constituency – hold elected seats in the French legislature. In a 1978 review, J A Hellen praised French Government atlases of the overseas departments, noting the masterful detail of the charts; cartographers treated the territories with the same care as any domestic French map. Constituents of French overseas departments enjoy similar privileges as their mainland counterparts in the European Union. But issues remain with this method of colonial administration. Time will tell if the new arrangement for the Dutch West Indian islands is as successful as France’s experience, or if the new countries will push for further autonomy. Should Britain follow this approach? In a 1995 article in The Geographical Journal, Stephen A Royle adroitly argued that the fifty-year Foreign & Commonwealth Office policy of the ‘right of self-determination’ had left Britain with a small set of possessions that genuinely wished to remain under London’s control. ‘Only in Bermuda,” Royle noted, ‘is there any interest in independence and even here it is a divisive issue’. Perhaps Holland and France’s trend is applicable to the future of the British overseas territories. ‘Dutch Antilles Dissolves as Two New Countries Created,‘ Reuters, 10 October 2010, accessed 11 October 2010. ‘Status Change Means Dutch Antilles No Longer Exists,‘ BBC News, 10 October 2010, accessed 11 October 2010. J A Hellen, ‘Review: Atlas des Departments Français d’Outre-Mer: I. La Réunion,‘ The Geographical Journal 144 no. 2 (Jul., 1978): pp. 376-377. Stephen A Royle, ‘Economic and Political Prospects for the British Atlantic Dependent Territories‘, The Geographical Journal 161 no. 3 (Nov., 1995): pp. 307-321. This entry was posted in The Geographical Journal and tagged Aruba, Britain, Cultural Geography, Curacao, Development, Economic Geography, France, Global Issues, Netherlands, Netherlands Antilles, Overseas Department, Overseas Territory, Political Geography, Saba, Social Geography, St Eustatius on October 11, 2010 by Benjamin Sacks.